Being from the Pacific Northwest, where we live under a perpetual ceiling of clouds, I assumed anywhere in California would be sunny. I didn't even bother to check the forecast before Nathan and I made plans and packed up the car to road trip from Seattle to Yosemite National Park. I was so excited to have been granted the time off of work that I was convinced the weather would be on my side. Needless to say, I was incredibly naive. After 17 hours of driving, three states and a lot of coffee, we rounded the bend into one of the most breathtaking sites to which I have ever borne witness. Natural wonders always move me on a much deeper level than anything man made and Yosemite was right up there vying for first place in my book. It's difficult for me to quantify 8000 feet in my head, so when I experienced Tunnel View for the first time, El Capitan towering to my left, Bridalveil Fall gushing out from my right, and Half Dome looming out there in the distance, 8000 feet felt more like infinity. The valley laid out before me like poetry and I was at an absolute loss for words. Time and time again, the natural world moves me toward tears. We tooled around the valley, doing our best to take in the delicacy of the Sequoias and the warmth on our skin without exploding from pure bliss. The rich greens and browns of the foliage, contrasted with the white granite walls surrounding us made this place feel like an ethereal dream. It's not just because we hail from Seattle that this Californian paradise was making us almost maniacally happy, but we had transitioned from a harsh winter in Tasmania right back into a harsh winter in the PNW, so it had been a year since we'd experienced the great outdoors dowsed in sunshine. We set up our tent in a grove of Sequoias and drifted off toward a much-needed slumber. We could not wait to wake up the next day and explore the trails, nooks and crannies the park had to offer. We awoke to a light drizzle, but were not defeated. The rain paled in comparison to what we have at home, so we made coffee and a hearty breakfast before taking to the trails. As the day progressed, however, the rain fell harder and we were forced to don our heavy-duty rain gear. The downpour turned into a deluge, but both our feet and spirits managed to stay dry and warm. We climbed a never-ending staircase to the top of Vernal Fall, and then further on to Nevada Fall, both of which were larger than life. The mist coming off the falls sprayed so far out that it was as if we were in the front row at Sea World. Not only were we being drenched from the rain, but now from the falls as well. The notion that we were going to escape the rain in California had quickly faded. We returned to camp that night incredibly wet, but no less enthralled by the valley than when we had arrived. However, when we awoke the next morning to an even more ardent downpour, we were a tad bit frustrated. Our gear was still soaked from yesterday and Nathan's camera had taken a vicious beating. Despite being weatherproof, the camera was no match for the elements and had unfortunately taken its final photograph. That puts quite a damper on things for a full time photographer. We tried not to sulk as we sought solace in the small confines of our tent. We woke up the next morning, the day we were to turn around and head home, to the most glorious day one could possibly imagine. The sunrays drifted down through the trees and floated hazily around our heads. Nathan made coffee to the tune of the birds chirping and we laid out our life to dry in sun patches. I could have been bitter that the rain chose to follow us down here from Seattle and stick around only long enough for our trip, but camp mornings are one of my fondest pastimes, so I couldn't be upset if I tried. We let the sun saturate our skin and inhaled as much of the Sierra Nevada air as we could before having to bid this magical valley farewell. 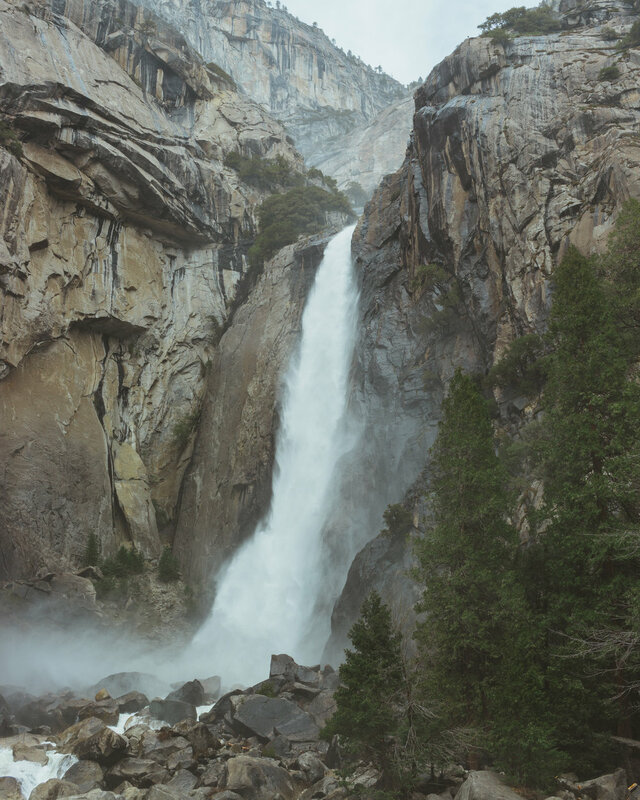 When I think back on my time spent in Yosemite, I don't think that I will even remember the rain, only the breathtaking natural beauty. ALISON HOWE is a Washingtonian, born and raised. Her reasons for existing include baking for her loved ones, writing novels and poetry, trail running, and consuming as much of the outdoors as time will permit. Few things bring her more peace than the potent silence of a mountain.